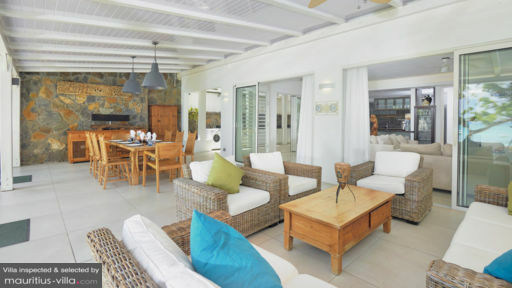 With an open-plan setting that provides dazzling views of the emerald green tropical garden, Villa Beach 4 is located in Pereybere, one of the most pristine coastal villages in Mauritius. In fact, the public beach of Mauritius is globally acclaimed for its silky sands and pristine, almost crystalline waters. Best of all, Villa Beach 4 offers an easy access to the beach, enabling you to make the most of what the island has to offer. Radiating comfort and elegance, with a quaint, tropical-like setting, this villa is also set in a fully secure compound. 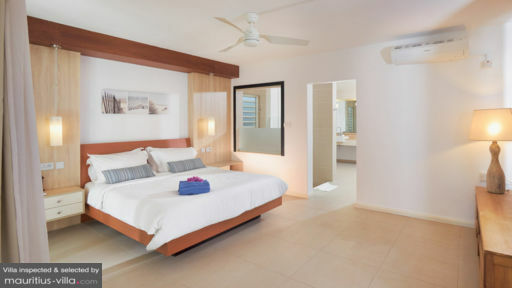 Designed to very comfortably sleep between 8 to 10 people, Villa Beach 4 boasts four bedrooms. In the master bedrooms, you’ll find a walk-in closet as well as an en-suite bathroom, complete with built-in shower, sinks and various types of bath amenities such as bathrobes, shower towels and face towels. The two guest bedrooms have a queen bed each, while the master bedrooms boast a king-sized bed each. With the beach on your doorstep, you simply need to cross through the complex’s gate to step out onto one of Mauritius’ most beautiful sun-kissed beaches. Indeed, guests of Villa Beach 4 can literally take a plunge in the ocean any time of the day- or night- that they wish. This villa also boasts its own private garden, which is ideal for lazy days in where you can simply lie back and relax on your sun lounger, soaking in some much-needed vitamin D as you enjoy your favorite book and a chilled drink. The sun loungers overlook the sea and this only serves to enhance the overall sense of tropical-style relaxation. In the spacious living room, you’ll find a flat-screen LCD television complete with satellite connection. A DVD player is also included. Wifi connection is available all through the villa. On the ground floor, you’ll also find an airy dining room as well as a fully-equipped kitchen which comes with just about any appliance and accessory that you’ll need to prepare your meals. These include, but are not limited to, espresso machines, microwave, dishwasher, oven, gas hub, fridge, kettle, freezer and various types of cutlery. During your stay at Villa Beach 4, you won’t need to bother yourself with cumbersome housework since different types of services and amenities have been set up to render your stay even more comfortable. For example, upon request and for an additional fee, you will receive daily dinner baskets which means that you won’t even need to do any cooking. On selected evenings, barbecue parties and Al-Fresco dinners are held in the communal areas for all the residents. On the complex, you’ll also find different facilities such as laundry and ironing services, luggage storage as well as a trendy bar with a pool table. On weekdays and Saturdays, a maid will show up to clean the villa and take care of tedious housework. Your sheets will be changed every three nights and the towels will be replaced daily. To enhance your stay, a a daily breakfast is offered to every guest, free of charge. 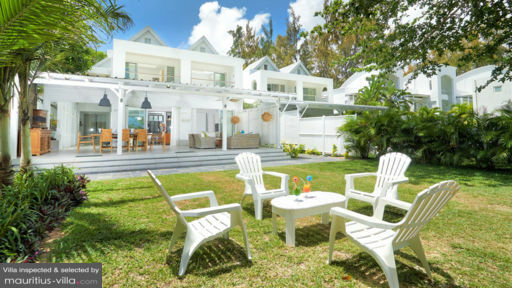 Villa Beach 4 is found near Grand Baie, a vibrant villa bustling with nautical activities and nightlife. In fact, a mere thirty minutes from Villa Beach 4 is found Banana Beach Club, which is considered as one of the best nightclubs in Mauritius.